Google is seeking beta testers for Course Kit, a free toolkit that uses Google Docs and Google Drive to create and collect assignments, give feedback to students and share course materials within the learning management system already being used. According to a blog post by Product Manager Brian Hendricks, Course Kit works with any LMS that supports the IMS Learning Tools Interoperability standard. Here's how the program works: When students post their work to Google Drive, Course Kit manages the permissions, blocking students from getting further access while their assignments are being graded. Instructors can give feedback on the assignment submissions using the in-line suggestions and margin comments available in Google Docs. When a faculty member is done reviewing assignments, the grades and feedback are synced to the LMS, students are notified, and file access is returned to the students so they can review the input. Simultaneously, instructors receive an archival version of the assignment to allow them to keep a running record of submissions. Course Kit also includes a new shortcut function that gives instructors quick access to commonly used margin comments stored in a "comment bank." According to early tester Ben Hommerding, an instructional technologist at Wisconsin's St. Norbert College, users at his institution found this feature "very useful." As he explained, the comments added to the bank can be "easily reused over and over or edited to make feedback more personal." 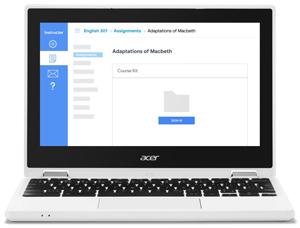 Another Course Kit function enables LMS users can embed course materials — assignment information, syllabi, lecture presentations and videos — from Google Drive directly onto LMS pages. Google Drive manages the share settings. The new service is available in 44 languages and, according to Google, meets industry standards for accessibility. Institutions using the G Suite for Education may request access to the beta. Once they're whitelisted by Google, the Course Kit can be installed in the LMS. The company said it expected to add "new and improved feedback functionality" into Classroom too, which should be available in the fall. Learn more about Course Kit on Google's education website.